Orderscape, Inc. is among the first voice automation software companies to crack the code on full-menu restaurant voice ordering targeting the global restaurant and hospitality sectors. “We are among the small number of technology companies worldwide to offer full-menu voice ordering solutions for restaurants," said Ted Cohn, CTO and co-founder of Orderscape. San Jose, CA, February 20, 2018 --(PR.com)-- Orderscape.com, the order automation and voice technology software company to help restaurants grow sales and build deeper and more personalized relationships with their customers, announced today a full-menu ordering certification by Amazon for Fazoli’s restaurants. Fazoli's customers can now order meals via natural language processing as an Alexa skill at some locations. Orderscape is among the first automation software companies to crack the code on full-menu voice ordering targeting the global restaurant and hospitality sectors. “We are among the small number of technology companies worldwide to offer full-menu voice ordering solutions for restaurants," said Ted Cohn, CTO and co-founder of Orderscape. 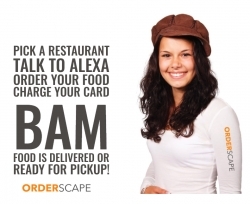 Orderscape is pioneering order automation using voice technology on a number of conversation channels like Alexa and soon, Google Assistant and Google Home. With full-menu voice ordering, restaurants using leading food ordering platforms like Olo, Onosys and Monkey Media software, among others, can extend their reach and provide a seamless conversational food ordering experience to their customers, creating another revenue stream while significantly improving the customer experience. “Conversational commerce, or the 4th pillar of online ordering, coupled with artificial intelligence is set to revolutionize digital ordering for restaurants. Voice makes it easy to interface with technology into one, familiar action: speaking. Conversational food ordering technology drives revenue and improves the guest experience at the same time," said Michael L. Atkinson, CEO and co-founder of Orderscape. About Orderscape: Orderscape’s customer engagement and conversational commerce platform powers the digital experiences that bolster the relationships between restaurant brands and hungry consumers. The Platform ties together the emerging channels of Voice (Amazon Alexa, Google Home/Assistant, etc.) and ChatBots (Facebook Messenger) to strengthen the customer experience, increase engagement, satisfaction and retention, reduce service costs, and drive additional revenue. Orderscape has accessed over 100,000 restaurant menus on its platform and expects to serve tens of millions of diners, from its growing restaurant marketplace. Learn more at orderscape.com. Click here to view the list of recent Press Releases from Orderscape, Inc.